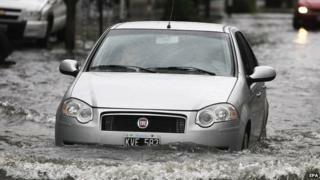 Torrential rains and strong winds in central Argentina have caused severe flooding, damaged homes and forced dozens of people to evacuate. The Argentine capital, Buenos Aires, was also affected, with flight delays and cancellations at its two airports. The National Weather Service has maintained an alert throughout Buenos Aires province. About 100 people were evacuated from the city of Bragado, 200 km (124 miles) west of the capital, reports said. The city suffered power cuts and damage to property after roofs collapsed and trees fell. The authorities in the city of Lujan, near the capital, have called on residents to leave their homes because of rising water levels. The violent storm affected several other towns and cities and caused chaos in transport systems, including the metro, commuter trains and buses in Buenos Aires. In 2013, one of the heaviest storms recorded in Argentina killed dozens of people in the province and forced thousands more to evacuate.